Decorate with some sliced strawberries and serve with whipped cream. Yum! Sieve in the flour in to the butter and icing sugar. Mix with your fingertips until the mixture resembles bread crumbs. Slowly mix in the beaten eggs and stir until the pastry comes together in a ball (you may or may not need to use a teaspoon of water or two). Rest the pastry in the fridge for 30 minutes. Take the pastry out of the fridge and roll it out until about 2.5mm thick and use it to line the a 12” pastry tin pressing the pastry into the edges. 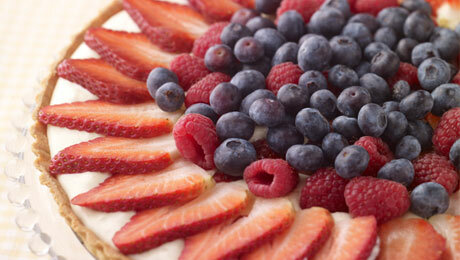 Place the pastry lined tart dish in a cool place for 20–30 minutes to prevent shrinkage at a later stage. Bake the pastry blind by lining the pastry with grease proof paper and filling with dry lentils and bake in the oven for 15–20 minutes at 180°C/350°F/Gas Mark 4, until the pastry feels dry to the touch. Remove the grease proof paper and lentils and return to the oven for 2 minutes. Take out of the oven, and set pastry aside while you prepare the filling. (The above can easily be made a day in advance, and covered until you need it). Place the chocolate in a bowl over a pan of simmering water for approximately 8 minutes until melted. Then remove the bowl from the water and add the egg yolk to the chocolate and stir. Meanwhile in a separate bowl whisk the cream and fold into the chocolate mixture. In another bowl, whisk the egg white until forming stiff peaks and add to the chocolate mixture, immediately pour over the base of the tart. Place in the refrigerator for 1 hour to set.